So we have moved into the stage where Harper is getting into EVERYTHING. If she's not going out the doggie door, she is crawling as fast as lightening into the kitchen and opening every drawer and cabinet. Or the bathroom. "What to Expect when you are Excpecting" failed to tell me just how exhausting being a mom of a toddler can be. Maybe it's because I'm pushing 40. She found her food drawer REAL fast. ha! Do all of you with babies have those things that you put on your cabinets to baby proof them? I'm trying to decide if we want to do that or not. Is it worth it? Or is it easier to say no or divert them elsewhere? Thankfully - Harper has yet to discover any of my Christmas trees. They are all in areas of the house she really never gets to so I think I may be safe! YEAY! 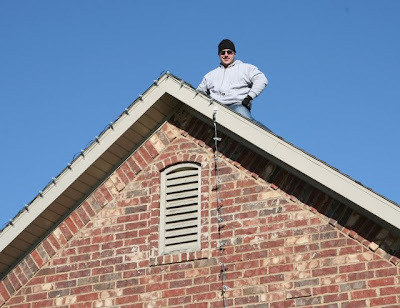 Here is my own personal Clark Grizzwold putting up our outside lights today. He spent ALL day doing it. And it was like 20 degrees. And we laughed at our neighbors who put them up in October. At least they did it on nice days. ha! We were the only house on our street without lights but we can no longer be labeled the Scrooge house. (We were actually just the "we have been out of town almost the whole month of November" house). I'm so glad he didn't fall off the house. My baby needs a daddy. I direct the preschool choir (with LOTS of helpers) at church and tomorrow we are performing in "big" church and again at night. I'm so nervous. We had practice today and they did REALLY well but in front of everyone could be a different story. Pray for me. ha! At least they are all so cute! After tomorrow - I will breathe a huge sigh of relief! Even though I'm a Southern Baptist girl - I like to think of myself as having a Dancing Queen somewhere inside of me waiting to get out. It looks like Harper is following in my footsteps. At OBU - we didn't have dances.....we had "functions". I think Harper might break it down at some functions one day! And just some more family fun! Oh She is just way TOO CUTE!!! I love the dancing video! First of all...Pushing 40...NOT!!! Second, Asher & Harper must have some sort of "energy" passing along to one another because that could have been him in her crib NOT napping...haha! My girls are loving these videos!! Mollie Kate is covering her mouth and laughing and pointing at the screen. So cute Kelly!! Trust me it is worth the time and energy, go ahead and put the locks on the cabinets you do not want to be diverting her for the next year or two. It gets old quick! Lady, get you some child proofing stuff if you ever want to cook! Moses is almost 16 months and I barely get supper on the table and I have the child proof locks. I did leave him one cabinet that has stuff he can play with. He now knows how to "help" in the kitchen! Good gracious she is too cute!! Seeing her just makes me want another one, just wish we could have another one. Thats OK, I am really enjoying my 7 and 3 year old!! Ya'll have a Merry Christmas!! Thanks for sharing all the videos! She is just precious! Kelly---My daughter is 14 months old and LOVES being in the kitchen under my feet. I contemplated getting the latches but soon realized it was better to not have her in there at all. We bought a baby gate that can be opened with one hand and we LOVE it! I can let her in if I want her in or keep it closed up. Yep, all of our lower kitchen cabinets are baby proofed! Our bathroom cabinets are too. Fun times with a toddler! It just never ends because babies are so smart. They figure everything out! Yes, I had those latches on the insides of my cabinets...provided some good peace of mind!! Sooo...now...when it gets down to 7 degrees at night, we are ready to decorate?? I think not! The videos are SO precious! I highly recommend putting locks on your cabinets now. We used Safety First's "Magnetic Tot Lok" set. They are magnetic and install inside your cabinet doors so it doesn't alter the look of the cabinets and you don't have anything on the exterior of your cabinets. It has a little knob you put on the outside of your cabinet when you want to open them and they magnetically open. We loved them and none of our kids could figure out how they worked until about the age of 6! Walmart sells the set for around $18, too. Oh, goodness, girl. . .I feel your pain! Wait until she is walking. . .or running!! My little missy put one of her books in the toilet when she was a crawler. What I do in the kitchen that seems to help is that I have a cabinet dedicated to things Cora can play with. (It has mostly tupperware and travel mugs.) She knows that she can go play with anything in that cabinet, but she is not to open up the others. I only have the cabinet locks on the cabinets under the sink where the cleaning supplies are. It took a little while to train her, but now she knows what she can get into and what she can't. In fact, if I leave any other cabinet or drawer open, she runs up to it to close it. Hope this helps! Harper is as cute as ever! I love the videos! Harper is too funny in the video dancing! What a gorgeous little dancing Queen! Thanks for sharing! My son was alot like Harper, he cared less about sleeping. I never did locks I have tons of cabinets I just made sure cleaning/meds were up high. I am a firm believer in they know what you are saying, give her a few things to play with in the floor so when she crawls in there she will see them and that is what she will do after. Good luck!!! Bless Scott's heart for staying outside in the freezing cold putting up those lights! I highly recommend Tot Locks, they are magnetic. They aren't hard to install and you can get them from Babies R Us. It gave me piece of mind, especially for the under the sink stuff. Good Luck!!! Definitely invest in the cabinet locks, they will save your sanity!!! I loved the videos, she's so precious. I especially like what she thought of naptime "pthhtttttt". If we didn't have the babyproof locks in our kitchen we would have a mess!! I def recommend them. Our whole first floor is pretty baby proof so I dont have to lock her in one room and my little one can go in out all rooms herself. I have a dresser in the spare room with some of my things and let me tell you that stuff is pulled out daily! If only I could child proof a dresser! Distractions doesnt work for mine!! Better to be safe than sorry! I hate to tell you that it only gets worse! So definitely get the cabinet locks...your sanity is very much worth it. My firstborn, Abby, NEVER got into anything. But my 2 yr old, Grayson, is into everything! I cannot say no or divert him enough. Cabinet locks have been a lifesaver! As a mother of 2 boys I didn't let them play in my kitchen drawers. Now as a grami to 2 little girls. I've always had a drawer for them to play in. It's full of their sippy cups/bowls/dishes/all plastics. I tell them it is theirs. When they want in others I tell them they are grami's. They now know which drawer to go to immediately and they empty it and fill it back up a thousand times! They honestly think it is theirs! And it is! I love that donkey thing! She is so cute the videos are priceless. So stinkin cute!!!!!!!!!!!!!!! I can't wait to take her dancing! :) I promise I will keep her off the tables! So cute! Evie is into everything too - she even ate one of my pearl earings this week. I retrieved it this morning but it will never be the same. We bought the locks but have been too lazy to put them on. I think it's time! Children change everything but I can hardly remember my life before 1/16. Can you? Evie is sleeping through the night again! YAY!Stay warm. Loving the videos... they crack me up! And that cute little tree in her room... loving that too! We put locks on two doors and those were the ones with chemicals in them. We trained our children that no meant no and they learned to stay out of areas that were off limits. It takes a lot of time and you are training her to respect authority at the same time. The Bible way of training works. We put locks on the doors under the sink that housed the cleaning supplies and locks on the food cabinet. But other than that the rest of the cabinets are free game. And my boys LOVE to get in the pots and pans cabinet and pull our every piece and then look at me as if they are going to get in trouble since they know that some of the cabinets are locked. We then do a jam session while I cook dinner. Don't know how long the pans are going to last as drums, but it keeps them occupied for a few extra minutes!! We have cabinet latches on every single kitchen AND bathroom drawers or doors brax can reach. Except his designated "junk drawer" that I filled with dollar store utensils/sponges/etc for him to get into to. The really hilarious part is that my husband and I are so utterly inept at handywork we actually had to PAY our handyman to install all these latches for us. It will save you a lot of headache to just childproof EVERYTHING. I put latches on every single drawer and cabinet in my kitchen except the one with the toys. It took me less than two hours and was well worth the peace of mind. Plus, that's a lots less time than I would have spent picking up. I highly advise it. BTW, that was almost thirty years ago and I still am glad I did it. Just wish I had the latches in this house (and may yet) because I now have a granddaughter just a few months older than Harper. First of all I have enjoyed so much watching Harper grow up this past year. Oh my what a walking example of God's grace and goodness! As far as child proofing goes, I was more in the "no" or diversion camp. I put locks on things I definately didn't want my children in (underneith the sink or anything you don't want broke. 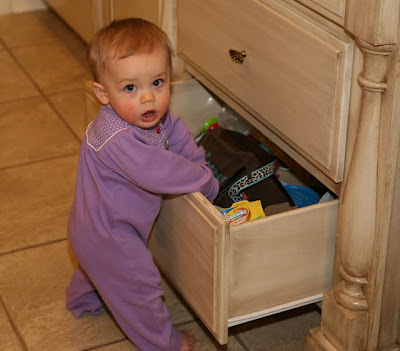 My thinking was always that I wanted my kids to have a few places that they could get into (a drawer or cabinet), but that also knew not to get into things at a house that wasn't baby proof. It was a little work in the beginning but huge payoffs later when my kids behaived properly elsewhere. We are currently living in the house I grew up in, so we didn't have to put anything on our kitchen or bathroom cabinets since my parents already had, but my little one does have a cabinet just for her-the only one they didn't put a lock on. It has our tupperware in it so its not like she can break anything in it and doesn't bother the other cabinets. She has fidge maganets that she plays with and will sometimes open the drawer on the oven, but that just has pots and pans in it, something she can bang on and not tear up. I love the videos! She is just too cute! I esp. love when she blew raspberries after you asked her if she was going to take a nap. What a cutie! We are renting, so didn't want to spend the time or money to babyproof cabinets that we will be leaving in 6 or 7 months. Almost all our cabinets have two that face each other, so I have pony tail holders wrapped around the handles to keep them together so Colten can't open them. Luckily, we only have a few drawers and he rarely tries to get into them. I do have one cabinet that has sippy cups and other sports bottles that I let him get into to play. When he's trying to get into something I don't want him to, I divert him to this cabinet. It works pretty well. I also got a cheap frame for our first son to play with- it had my husband and I in it. He loved to carry it around, and it was what I would send him to instead of jsut saying no. He is almost 16 and that frame has survived 5 kids and NOT broken yet! The ones that I wanted everyone to stay away from are usually the ones that bite the dust. :o) go figure! My youngest used to go thru the doggie door all the time when he was around Harper's age. I laughed when you asked if she wanted to take a nap and she stuck out her tongue...she's so precious!! After having 3 kiddos, we still have never put things on our cabinets. We use the clear plastic pony tail holders to keep them closed. It has worked perfectly with all three. Love the dancing videos. Cash will not dance for the life of me. We have tried everything!! Ah! Harper is so, so sweet! BUY THE LOCKS!!! The ones that hide inside your drawers/cabinets and are magnetic (because the ones on the outside will ruin your cabinets/pulls and the ones that allow fingers to get smashed are no fun.) They are a little pricey but as far as I'm concerned more then worth the money!!! Love them!!! I have a "Yes, Yes!" drawer in my kitchen. (The rest are "no, no" drawers.) The yes, yes drawer is filled with toys, big refrigerator magnets, and what ever else my almost 17 month old decides to throw in it. I did the same thing with my now 3.5 year old, and it worked great. I have a child lock on the cabinets below the sink, since we keep dishwasher soap there, but otherwise we don't have any other locks in our kitchen. I only baby-proofed the cabinet with the cleaners and stuff in it and practiced teaching my babes to respond to "no" with the other ones. I always had a drawer just for them that I would take them to after telling them no to the other cabinets. She is just so darling. I can't take it. I wonder if she might sleep better if her bed was not right next to the window. I'm sure you have her room set up like you like it, but that might just help. My oldest is 4 and once he was mobile he was in to everything! (I found him in the bathroom sink with the water running on him when he was 18 months old!). I didn't want the hassle of child locks so we just used baby gates to keep him in the living room/hallway/his bedroom. It actually worked really well, minus the one time I left the bathroom door open... Harper is adorable! Please babyproof.......we have twin boys, now 3 years old and I would have went insane without babyproofing. We have a friend that her little boy crawled in the bottom drawer of an amoire and it toppled over on him.......he was 18months. He was a twin and they lost him. We have almost everything braced in our house. Please remember that no amount of babyproofing will keep accidents from happening but it could help. We even did our kitchen drawers. I say DEFINITLEY put the locks on the cabinets! My daugher is 15 months and she is into everything. It's worth the time it takes to put them on. I leave one bottom drawer with some tupperware in it for her to play with, but all the others are locked. We gated off the kitchen when my kids first started crawling/walking! They were only allowed in there to eat. By the time they were 18 months, they were allowed in there, and they didn't get into anything. There is nothing that can prepare you for the toddler active stage! They are so busy. And I love the look on Harper's face when she is in the drawer, the huh, what? look is my favorite! She is too cute! We only baby proof the cupboards in that have dangerous things in them like cleaners. Most of the other drawers and cupboards are fine for them to get into and it keeps them entertained. I might have to pick up the kitchen towels and the tupperware lids a million times, but if it gives me a few moments to make dinner it's all worth it! :) Eventually it will lose it's appeal and my boys even help me put the dishes away now and they are almost 3 and 18 months. I would encourage you to go ahead and childproof the cabinets. Leave one or two she can get into that are safe and childproof the rest. With my first child (he is now 14), who was into EVERYTHING and so active, I insisted on not locking things up and I regret it now. I would have enjoyed parenting so much more at that stage if I would have just done it. I am sure you will make the right decision! Harper is a doll! Love the videos of Harper! She is just precious!! Could she have had a more perfect response at the end when you asked if she was going to take a nap?! hahaha!! Also laughed when you asked her to say mama!! She is hysterical! And there is NO way on God's green, cold earth that you are pushing 40!! Are you kidding me?? NO WAY! I just don't believe you are anywhere NEAR it!! We did use cabinet locks in the kitchen and bathrooms. It doesn't take them long to figure out how to get around them. We also kept our meds in a LOCKED closet. After a weekend in the ICU, we discovered she had learned to bypass the locks. (She was 3 at the time and went plundering when she was supposed to be going potty.) After that, anything that could present a risk (including toothpaste!) went into a locked and alarmed cabinet. The alarms are $1 and work very well. I love your videos! What a cutie pie! Harper is just precious. My Parker would also rather play and be a clown rather than nap. We do have the locks on some cabinets, and it has saved my sanity. I also bought a leapfrog toy that is a magnetic farm house to put on the refrigerator. It has animal magnets that you can place in it and when you push it, it plays music and animals sounds. It is a great distraction while I am trying to cook or clean in the kitchen. we did very minimal baby-proofing. only the girls' bathroom undersink cabinets are safety-locked, and the cabinet under the kitchen sink with my cleaning products. other than that, we don't babyproof anywhere else. we decided early on that since most places we go aren't babyproofed, it'd be best to teach our children to simply not get into stuff at our own house. our oldest is four, and it's worked beautifully! and our two-year-old recently taught our four-year-old how to open the safety locks on those couple of cabinets anyway, so i'm glad we didn't go to all that trouble to lock every single one! Wow...there are some scary toddler stories on here! :o) I'm not sure we should ever try for Baby #2! lol. We only put safety latches on our kitchen sink cabinets. Our Hallie was always into everything, so we made sure to have a drawer she COULD get into with things in it that wouldn't hurt her. When she opened the cabinets that were "off limits" (breakables), we just told her "No, no...that can hurt Hallie". It took some time, sure, but it was a great teaching experience in my opinion. We bought the cabinet/drawer locks but never put them on anything other than the kitchen cabinets and kept cleaning supplies in there and on the shelf in the laundry room. The only gate we ever had was for our stairs. Harper is so stinkin cute! Love the video of her dancing! Merry Christmas! You absolutely positively MUST install some babyproofing locks. If you have cabinet knobs, you can try rubber bands looped from one knob over to the next one. That'll work for a while, a very short while I might add until your lil sweet Harper figures out how to remove the rubber bands. My twin grandgirls are four and I just recently removed the child locks. And they don't even live here! you should definitely put some cabinet locks on! otherwise you will make yourself CRAZY taking her away from them every 10 seconds. Even though my youngest is two i still like to have them, because otherwise she would try to steal cookies all day long! My cabinet latches from my 8 year old are still on. We never removed them. Thank goodness because this 8 month old of ours is already into everything. Unless you want to get nothing else done all day, put the locks on the cabinets. Harper will still learn to obey you. Getting into cabinets is the least of your obedience worries. I was also going to say to maybe darken her room a tad. My baby's room is dark for naps. Otherwise, I think he would be just like Harper! "Show Us Your Life", you should do 1st Birthday themes. It's birthday party planning time for us and I want to see what people did for invitations, colors, cakes, etc. More people read you blog than mine (WAY MORE!) so, if you think it's a good idea, I'd love to see it. By the way, great videos! i have a baby the same age as haper and she loves to do t he same thing. I have 2 other children as well. I have never ever used childen looks on my drawers other than the ones with cleaning stuff and pots and pans or eletrical things. Can be fustrating but we don't want to drill into our good cabniets and make holes. Or we have a hard time getting in. i believe in safety but also believe in creativity and expressing themselves meaning having a tupperware bowel and stacking or banging on a bowel with a wooden spoon . I learn' that from a mom of a boy that I use to babysit everyday. She had a tupperware drawer at his reach and we spent hours stacking to make towers and knock over oor making music with them. I've never met a kid who loves there toys but most of all is happy or in love with a cardboard box or a spoon or tupperware to play with. Yes its fustrating to clean it up or hard to get things down at times but I love watching what they come up with or invent with these things called wooden spoons( Gutiars) or whatever. YES it is worth it to get the drawer latches!! You will be so happy when you do. It just gets worse as they get older. BABY PROOF! LIFE IS TOO SHORT TO BE TELLING THEM NO ALL THE TIME..
ONLY LEAVE ONE CABINET THAT THEY CAN GET INTO AND PULL STUFF OUT. I LOVE Harper's dance video. That was so cute, I had to watch it twice! I am in the minority on the child proofing. The only thing I ever childproofed was the cabinet that held my cleaning supplies. I train the kids. It is not an easy task, but it is SO worth it, I think. It takes a few VERY consistent days but it makes life SO much easier for years to come. They do not get into the areas that they are not allowed in and I don't have to fumble to get into my drawers and cabinets. The people we visit are glad I took the time to house proof my children since that training comes with us while door latches would have to stay home! It is hard work, but it is SO worth it! And YES YES YES get the cabinet locks...it might get worse. Or at least for us it did, I almost pulled my hair out. They have different kinds and even little magnent ones. HI Kelly, When my boys were little, I put the cleaning supplies in the cabinet over the frig. My cabinets do not have hardware on them to be able to install locks. I let them play with pots and pans and Tupperware. They also played in a playpen. I know that is passe now, but at least I could cook in peace and occasionally go to the bathroom alone. The videos of Harper are so cute. She dances very well. Good rythmn. And she said DADA!! oh my she is so cute and funny! I cant stand locks; so i have baby gates everywhere; the are ugly but the work. ok, i have officially fallen in love with Harper...she is too cute at this point. she is reminding me of my own daughter now at that age. lol. AND you are a great mom too Kelly. Yep, definitely baby-proof. It will save all the chasing. And it is a lot of chasing because this stage doesn't end for several years. So I have hesitated to give any advice because you get tons of comments and I never read them so I might be repeating stuff you've heard, but...I know that you have mentioned that Harper is not the best napper and I noticed that her crib is right up next to a window. We discovered with my oldest, that window darkening shades were miracles in a box. They make room darkening roman blinds that are very pretty. My 4th baby is now 15 months old and I don't think I could function without those things. They really helped all my kids be consistent nappers. haha - I just watched your videos and Hudson walked in. He says, "Awww that baby is just so cute" in the squeakiest voice he could muster. Kelly, Harper is just precious in these videos!!! My son Henry is 13 months old and we have put the child safety latches on our kitchen cabinets - it has made life so much easier (and safer!). At least one previous commenter mentioned having baby's own cabinet with safe things to play with, and we have that and Henry loves it! He just goes right to it and opens it and takes everything out (we have old tupperware in there, an empty oatmeal can, a cardboard box or two, you get the idea :-)). Kelly-Great post! As far as latches on every single door: You seem like a good mother who will watch her child every second. One thing my husband and I were big on was not turning our beautiful home in to a home that looked like a daycare. Most importantly, I think now is the best age to teach Harper what "no" means. If we allow our children to attempt (locked cabinets) to do things they are not supposed to (even if they do not succeed) it is a set up and harder for you later to get her to mind. While Harper is still a baby, she is perfectly old enough to know what it means when you give her a fairy stern "NO". I don't think it is a good idea to give her a toy cabinet that you allow her to get into, b/c it is hard for her mind to decipher that only ONE cabinet is okay. It's during this time in her life that she is starting to figure out what she can and can't get away with. 1. Hairties/elastics keep neighbouring cupboard doors shut. 2. The house takes on a temporary cluttered look for a couple of years as everything, gets moved UP out of reach. 3. We are wrapping our beautiful china cabinet in a very thin camping mattress this week, until our twin boys are older, so they won't smash the glass doors. Boys bang things. We are teaching them NO, but the sin-nature makes sure they sneak back, when we have our backs turned. 4. We'll be putting our Christmas tree in a wooden playpen, as soon as we get one. We're not game to put it up yet! A baby gate you can move round the house as needed is a good investment, and , O, I got one of hubby's old ties, and tied the door of the wall oven to the griller, after little fingres got pinched. I take it off to bake, then put it back as soon as the oven is cool. Kelly, I agree with Ginny. Now is training time. I can't tell you what a wonderful testimony it will be to others if you invest the time now to train her 'no'. It will make you stand out, give you opportunities to say, "We train our children according to the Bible." She will disobey, but if you take the time and energy now, life gets a whole lot smoother later. My oldest is 10. She called me from a friends to see if she could watch a movie before they turned it on. It was precious to me and so worth all the work. One more thought...it does take a lot of exertion to train rather than just restrict (with latches), but just think how wonderful it is when you are out, crossing a street, etc. and your child is trained. It pays off later! Kelly, two of my cabinets have those baby proofing things on them because they were here when we bought the house. I hate them. It's really a pain for me. So for all of the other cabinets I have just moved anything dangerous and I do a lot of diverting. It's working so far and it may also help when he's in someone else's house if he just knows not to open cabinets. Ummmm...okay...she is so cute and she would have so much fun with my son Tripp. He takes his socks off all the time too! =) I love the way they try to "talk" all the time. So cute. Anyway, I hear you on the baby proofing. I have a lot of friends that didn't baby proof for their first kid, but when they had the second, they did. I baby proofed EVERYTHING and I mean everything. I had twins first though and I am home all day so making it impossible for them to get into something was easier than saying no all day long to two little ones. I have gates, locks on my fridge, garbage can, drawers, I have taken furniture out of my living room, moved it in front of places like the tv, the chrismas tree, we even bungee corded our kitchen chairs to the table cause I was afraid they would pull them over on top of one another. I know, crazy, but they were into absolutely everything. My twins are 2 and 1/2 now and my third just turned one so you can imagine what my house is like. In fact, my twins just got into some paint that grandma got them for a present. I went upstairs to lay Tripp down for a nap and grab some laundry. Gone about 5 min max. They ran into the other room, had to have searched high and low for the paint, then get it out of the box, UNSCREW all ten bottles and empty them out all over my living room carpet. Yep, didn't know they had the dexterity to unscrew lids, but now I do. It was the biggest mess I have seen by two little kids and I have seen some good ones. I took pictures, yes. Uggghhhh. So yes, I am for babyproofing! =) Happy Sunday! Girl does have skills!! That is so cute:) I love, love the raspberry she did when you asked her if she was going to take a nap. HA!! The only cabinet I used a lock on was the one under the sink with all the cleaners. But other than that I just had the pots and pans and tupperware cabinets that I let them play in. I think it's hilarious that when you asked her if she was going to take a nap she blew a raspberry at you! I guess know you know how she feels about napping...HA! My 2 year old also LOVES to take off her shoes and socks as soon as she gets in the car. Personally, I just child proof the entire downstairs.. well, at least 80%.. and then my day is less stressed because whereever my 1 yr old goes, he's essentially safe AND so are my belongings.. I choose to use the child locks because I am already telling him "No!" a lot in the daytime when he runs at me with a toy raised high like he's ganna whack me.. or when he's touching the garbage can, or biting his brothers, etc.. so I take the approach of it's not HIS fault he wants to explore.. so why yell at him all day long.. and besides.. they won't listen!!! ha! My lil one figured out how to climb UP on the couch yesterday.. but not down!! can you say BONK!! yep, he rolled right off and I was sitting there watching him.. it was just so quick.. poor baby.. ok, ill stop writing you a novel now. ta ta! "my baby needs a daddy." I laughed out loud. Love the videos! Wow, there are a lot of opinions here!!! The only thing that I would add is that you need to think about when Harper goes other places. Yes, having babyproof locks on the chemical closets/cabinets is a must but other than that, she needs to learn that "no" is "no". When friends come over here and their toddlers don't understand "no" b/c in their houses there are just locks on things they aren't supposed to get into, it's kind of annoying. All children need BOUNDARIES and they need to be set at a young age. We don't babyproof anymore but did minimally when we needed to. Our children are ages 6-11 (4 of them) and we are down to just one cabinet that they aren't allowed into -- the medicine drawer. It is not locked, they have just learned respect and understand that it is one drawer that only adults may open (even though it is at their level). I strongly encourage you to do what you think is best for you and your family and most importantly, Harper. Reading some of these accidents made me realize how God's hands were with us through those years and how incredibly blessed we were and ARE. Enjoy this time with her -- soon enough (or people keep telling me) they won't want to be in the same room as you - ha! I would get the child-proofing stuff. I don't know how you ever say no to that sweet, adorable little face! I love the videos! And laughed so hard about the OBU functions! I'd totally forgotten that we had to call them that! Maybe our baby girls will function together one day!!! Two words: Baby proof. You will never be able to keep her little hands from everything. I'm REALLY surprised she hasn't went near the trees. We used the cabinet locks with both of our kids. But we only used them on the cabinets and drawers with something dangerous inside. Like under the kitchen sink there were chemicals, and another had small kitchen appliances that could hurt a child. I made sure they had a cabinet they could open and play in. I kept all my Gladware, Tupperware, and plastic bowls in one cabinet. They knew they could open and play in that one. I really tried to move harmful things into top cabinets rather than lock the kids out of them. They learn by exploring, and the locked cabinets are the ones they want in the most....just because it's locked! Good luck. I know whatever you do will be right for y'all. I was watching your movie with Harper chattin' it up and my 5 month old was laying on his activity mat. As soon as he heard Harper, he stopped everything he was doing and listened. Quickly a smile filled his face! I don't know if he was so excited that another baby refuses to nap or if he thought Harper sounded cute ;). It's so funny that you called him Clark Griswald. Good luck on the babyproofing. We only did locks on the sink cabinet where the cleaning supplies were and one bathroom cabinet where the bath cleaners were. Otherwise it was a free for all but they never really messed in anything but the plastic cabinet. The video of Harper dancing is just too cute and you did a great job on the tree for her room! It is so fun! Baby proof those cabinets girl! It's worth it! i would definitely put some cabinet locks in your kitchen and bathrooms. we left 2 or 3 cabinets open so Bryan can get to the non-breakable things. 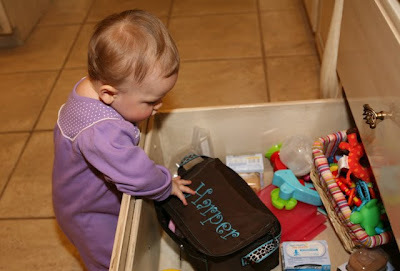 :) a tupperware drawer is always fun to play in and so are pots and pans. The baby-proofing worked great for my firstborn - a girl. Then Skyler came along and learned rather quickly how to use brute force to by-pass it all. Instead of saying "no", which will be repeated back to you before you know it, we used the phrase, "Not for your hands", and gave the kids something that they could have. A subtle difference, but the message is the same and it lays the foundation for the future when adults are allowed things children are not. I was just watching Harper's nap video and Romeo who is sitting beside me really liked when Harper was talking! He got right up to the screen and turned his head back and forth! It was so cute! Love both videos! She is such doll dancing! She will be showing out at OBU one day! With my first two being twins and keeping me busy, I faithfully put latches on all kitchen lower cabinets. Emily could not open them, but she would get her twin brother John to do it. She woudl point at the one she wanted open and grunt. He would then open it for her and crawl off back to whatever he had been doing. Our baby boy (our first child) should arrive this week, and these little videos make me even more impatient for him to make his debut! There is such joy this Christmas in seeing video of the healthy little girl who had such a frightening start in life. May God bless her with continuing health and happiness. We all know she is YOUR happiness. We did do some 'baby proofing' for the cabinets with chemicals. We didn't have to do much with drawers, our little one was a peanut. But, I did make one cabinet all hers to play in. I gave her plastic containers, spoons and a few toys for her to roam in. I would re-direct her to that if and when she would attempt to play with the others. It worked out very very well for us. oh my word she is SO cute!!!! and i'm still not over that pink tree. i'm on the hunt for one right now! Example: She's been so good, she is otherwise happily occupied, and maybe you need a quick trip to the bathroom, and in the short time you are in the other room, she gets into trouble. As you have a lot of friends with little ones, it offers protection for other little ones who may be visiting too. It's just a good idea and gives you one less thing to worry about. We babyproofed a couple of months ago when B started getting into drawers - and the bad thing is, he can still open them and if he wanted to, smash his fingers. He just cant open them the whole way...so I don't know how useful that is! We did not baby proof the cabinets or drawers. We have always just told the boys "hands down" when they were headed in that direction and diverted their attention. We decided not to do it b/c when we go to other houses that aren't I didn't want to constantly be on the watch for cabinet raiding and worry about them breaking other people's stuff. I needed a sure fire way to make sure they were safe in all situations and learned to stay out of the drawers and cabinets. we always figured it was better to teach them not to do something than to "solve" it all by locking it up. We keep our dangerous things in the closet at the top that the kids can't open and get it but for the other stuff... keep nondangerous stuff in them and teach her no.. won't kill her to learn it!! Especially this year at christmas! I have a 2 yr. old who thinks that everyday the tree needs to be "redecorated"... she'll learn!! Isn't it funny how you thought your immobile child was exhausting....and now the real fun of chasing begins. :) We have done really well at making our downstairs babyproof to the point where we can relax while she wanders around and we know she can't get hurt. Oh my, girl - she's a mess! :) Love her, she's just the cutest thing in the world! And I about spit my diet coke everywhere when you said you were glad Scott didn't fall off the roof! hahahha I'm glad Harper still has her daddy! For my daughter, I had a cabinet specifically for her. My mother in law sells Tupperware and that was Lila's drawer. She could take them out and throw them around my kitchen all day. It allowed her to be with me and I never had a problem with her going to other places in my kitchen. If she tried, I would tell her that she had her cabinet. She was happy with that! I hope it helps! I loved the videos. She is so cute. What timing she had on your question at the end of the 2nd video: "Harper, are you gonna take a nap?" Then she did that thing with her mouth and tongue to say, "I don't think so." Cute! I was reading this post with my son in my lap who is a couple weeks older than Harper, as soon as I played the video he got very still and began "talking" to her. I think he may have a crush. Ha! I can so relate to the getting into everything. However, we found that the push down type of child locks did not work. They are a waste of time. I would recommend the magnetic type and if $ is an issue only do it on the areas that have medicine and cleaning supplies. Our, now 4 year old, figured out the locks before he was 18 months. Harper's dancing video is precious! Harper is too cute! And I so remember the "gets into every thing stage". I am rolling over in my chair laughing at her. She is absolutely hilarious! Too cute. I love how she says Dada and when you say mama, she looks at you like, NOPE NOPE NOPE, ha ha! Definite daddy's girl. She has some moving skills.. aww. Do NOT think it is worth it to do the cabinet things. I am on child #3 and rubber bands around knobs and moving breakables higher are just fine. I make sure my bottom drawers have towels, bibs, etc for them to play in. Just my opinion! Harper dancing is too cute - right next to your cute southern twang! Love it! So sweet! But yes it is SO worth buying the cabinit proofers, I have a 4 year old (2 and 4mo old too) and she still needs them! I don't know if it's a girl thing or if we're just lucky, but we didn't baby proof the house. We gave Lili certain cabinets, etc that she is allowed in and can take things out, etc. Others, we just say "Oh no, that's not Lili's cabinet/drawer, etc" She is 18 mos old and so far it has worked beautifully. Granted, she is never not being watched for a second so it's easy to reinforce, but she only has to be reminded every once in a while. We felt it was important to teach her how to move about the house safely while supervised vs locking everything up. Of course, I pray everyday that we made the right decision...but I do think making things too babyproof can give a false sense of security as well. As a mom, you have to listen to your gut and do what works for your family. You definitely should invest in the child protective devices. Probably for more things than you even know - cabinet doors and drawers for sure. This stage lasts for at least two to three more years! I highly recommend cabinet locks. 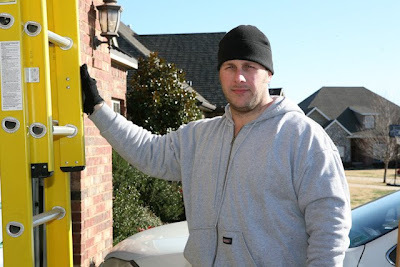 We also use "Tot locks" that are magnetic and they work great. Everyone else is right, the getting into everything gets much worse, especially when they start walking and climbing and trying to use anything and everything as a ladder, stepstool, etc... The locks will give you some peace of mind. I took a drawer and put things like plastic spoons, pot holders a spaghetti sifter or cookie cutters, that kind of thing. I left it unlatched and my boys would sit and play with those things because it was like they found something forbidden. You have to give up a bottom drawer but it's totally worth it. Yep-- I'm right there with ya!! We put all of the little white plastic cabinet latches in the kitchen, spent all day doing it and then watched Jackson figure it out in all of about 5 minutes! We did buy the magnetic locks to put on the cabinet doors that hold chemicals and such. They are more expensive but I think they are worth the investment. As for the kitchen drawers I am at a loss on that one-- we just let Jackson play in the tupperware drawer and he pretty much leaves the rest of it alone. From a mom whith one who literally RUNS everywhere-- good luck!! But they sure are fun!!! Hi! Love your blog! Love the videos! She is so cute! About the cabinet latches...I felt like they were too big of a hassel for a passing phase, so we bought some extra wide gates for our living room/kitchen entry doors and just made the LR a safe play area. Once he sarted walking more and could understand staying out of the cabinets, we took the gates down, and he has never again had intrest in what is in them. Worked for us. We are trying it again with baby two right now! Fingers crossed! We use the bottom drawer technique. Jacob has his own set of toys in our kitchen and he loves to 'discover' those toys since I switch them out regularly. He also has full access to the rubbermaid cabinet which means all I do is clean it up but it's so worth it. Now that have the circles have become "o's" and now that he will beat on them like drums. The only thing we baby proofed was our computer desk drawers since they provided too much entertainment and trouble for Jacob. Baby proof the kitchen and bathroom; it will save you lots of stress!! We divert some, but it's nice to be able to cook without worrying about the kiddo(s) breaking stuff or hurting themselves, and I like to be able to get ready in the bathroom with the girls in there, too. One thing I've liked is having a cabinet just for them in the kitchen. It's full of tupperware, empty coffee cans, and other things that are fun to play with. My almost three year old still enjoys this cabinet. I also don't have a latch on the pots/pans cabinet -- what's being a kid without banging on (or climbing in) some pots and pans?! I'm sure you'll get lots of advice, and you'll do what works best for your family. This may sound morbid, but I really strive for my home to be safe enough that if I dropped dead in the living room, my husband would come home to find two crying, hungry, dirty, SAFE AND ALIVE little girls. As always, Harper is a cutie! I've used a cabinet lock on one cupboard when we were overseas because there was no other place to store cleaning supplies- nothing else was dangerous if they did get into the cupboards. Otherwise, our children are taught to stay out of the kitchen until they're walking and when they pass that marker, they may not pull things out of the cupboards (I did keep a basket with some kitchen items to play with- I didn't have low drawers). Part of our philosophy is that it's just easier in the long run to teach them to obey starting with small things, and also, I can't expect others to childproof their homes with locks and such- my kids are told no and they don't mess with others' cupboards, remotes, phones, newspapers, etc. when we go to visit which makes the time spent there much more pleasant. It's possible to train and to let the kids be kids, too. We've found some helpful resources if you're interested; my e-mail is on my profile. She is a doll! I have three daughters. We have never baby proofed our house. The reason for this, is because other places you go will not be baby-proofed, so it's easier to teach them that they can't get into everything. One thing I did do in the kitchen is use a couple of bottom cabinets for tupperware and plastic things. That way my girls can go in a play with those while I cook. It works really well! She's such a doll! My daughter rarely wears socks in the house and we're in Michigan! Those magnetic cabinet locks are great, my friend uses them and loves them. Maybe Harper won't take a nappy cause it's too light in her room. I'd recommend room darkening type shades, she'd probably zonk right out with those. Keep the cute posts coming...she makes me giggle and I love your blog. I owned a little country store for several years and you could tell the children that knew the word "no". My favorite thing was when the Mommy would say, "This is a 'pocket store' ~ meaning both hands go into the pockets until they leave ~ then, I think they got a little treat (Cheerios?). I personally had the childproof things put on my cabinets and I loved them. Kids are quick! You may not be right there to say "no". The only cupboards I couldn't childproof was my Lazy Susans and my son would pick those cupboards to vandalize. My Mikasa dish set lost several lids...=]. Harper is such a HAM!!! The videos were too sweet!! You can just see that tired/wired look on her face in the 2nd video. She will do anything to stay awake!! :) Thanks for sharing! I fully agree that it is important to teach a young child "NO" and obedience. I also agree that children, like all adults, are born with a free will and will challenge boundaries, and should be subjected to natural consequences. I recognize that other folks are not expected to child-proof their homes for our children. However, there is nothing wrong with putting barriers in place to minimize specific dangers. Putting locks on cabinets that contain potentially harmful items is not the same as choosing not to train a child to obey. I think of it something like a stove. From the time a child can reach the stove, parents have to train the child not to touch it. We said "No, that will hurt baby", because we knew she understood hurt. But, when we had a pot of boiling water or stew on the stove, we did not rely on her obedience to our instructions. We took simple steps to ensure her safety should she have chosen to disobey. For example, we made sure pot handles were not turned in such a way that she could reach them. Protecting by providing physical barriers does not mean the child will grow to become a brat. Nor does it allow the parent to be distracted, because it isn't foolproof. It is just a tool that can be helpful and can provide a little peace of mind. I absolutely love the "screech" in the nap video. I predict she is going to stand up for what she believes in :)! She is too cute! That face when she's getting in the drawer is adorable! I love the videos-you should post more! Yes, install the cabinet Anit-baby device and be done with it. Saying NO only works so much...and you can't always have an eye on your child. It might only be 30 seconds but that's still 30 seconds she can get into somelthing. I thought they would be so annoying but really, you get used to them and dont even think about using them. she is pretty much the cutest ever. Love the video of her dancing. Too cute! How sweet is her laugh? Harper is just too cute! love that first pic..."oh, busted." you have the best accent! can't wait until i have a baby and can talk to her in the crib!! how fun! I have a 3 year old and a 1 year old and we don't use anything but a baby gate in the door of the hall to their rooms (and that's just for my sanity and to contain thier toys) I have bleach and cleaners under my kitchen sink with no latches - my kids know they're not allowed in there and it was enforced with "no" and spankings until they learned. I don't let them roam in the kitchen without me right there because of potential dangers should they disobey the one time (once is all it takes). But, I feel like it's a waste of time to install all those thingy-ma-bobbys and alot of kids learn how to open them anyway. As long as you keep an eye on Harper, I can't see why you'd need them. On the kitchen cabinet lock things, definitely invest in them! I have 4 kids (ages 1-6), and we had them in our old home and now in our new home. They are invaluable! Kids are curious and will always be. I want to keep a positive tone in my home...saving the "no" for when they are a bit older than Harper and for things that really matter. The latches will keep you from saying "no" a million times a day.